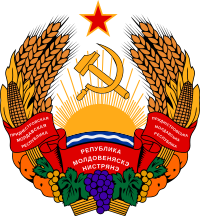 The coat of arms of Transnistria constitutes a remodeled version of the former Moldavian Soviet Socialist Republic emblem, as substituted by the internationally recognized Moldovan government after the dissolution of the Soviet Union in 1991. The only major pictorial change made in the Transnistrian version involves the addition of waves, representing the River Dniester. However, the inscriptions on the banner were changed: unlike the Moldavian SSR emblem, which bore the acronym "РССМ" (for "Moldavian Soviet Socialist Republic") and the USSR state slogan "Workers of the world, unite!" in the Russian and Moldavian languages, the Transnistrian emblem bears the name "Pridnestrovian Moldavian Republic" in the Moldovan, Russian and Ukrainian languages. In Moldavian, it reads "Република Молдовеняскэ Нистрянэ" (transliterated: "Republica Moldoveneascǎ Nistreanǎ"); in Russian, it reads "Приднестровская Молдавская Республика" (transliterated: "Pridnestrovskaya Moldavskaya Respublika"); and, in Ukrainian, it reads "Придністровська Молдавська Республіка" (transliterated: "Prydnistrovśka Moldavśka Respublika"). 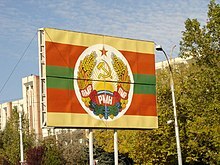 Despite the emblem's depiction of the hammer and sickle, Transnistria is not a socialist state. This page was last edited on 30 March 2019, at 12:46 (UTC).